Recently James shared a post with you about THE basketball scouting question that you need to answer in order to be a successful scout. Much like James I love this question! It’s the most important question to ask when scouting. But it’s just the first step of what James and I call contextual scouting. Contextual scouting requires looking at WHY a player was successful in the area that would earn him or her minutes at the next level. The next step after that question is to examine the CONTEXT behind that player’s performance. Did the coach put this player in a role that allowed the player to succeed — or a role that limited what the player does well? Did the player share the court with teammates whose skills made things easier for this player to succeed — or more difficult? Does this player have physical advantages over competition at this level that drove the success — or did skill drive the success? Did this player play in a system that played to this player’s strengths? Did this player play in a system that covered up for this player’s weaknesses — or one that highlighted the weaknesses? By asking these questions you can get a better feel for what makes that player successful. You also gain additional context that comes in handy with the next step of the process. To project a player on to the next level, you have to build upon that contextualized performance further by asking more questions. How much of this player’s strengths will translate against bigger, stronger, longer, faster, springier, more skilled and smarter players? Do this player’s strengths and weaknesses fit well into — and even elevate — our system? Does this player complement and elevate our stars and our core — or are his skills redundant? How valuable are this player’s strengths in the way the league is playing? How detrimental to a team on the next level are this player’s weaknesses? You must be able to explicitly say WHY a coach at the next level will put this player in the game. Otherwise you take a massive risk that the coach won’t be able or willing to give this player minutes. And when a player can’t get minutes on the court, he or she probably won’t be impactful. When you scout for a particular team and you don’t consider how that player might fit in with what you already have in place, you jeopardize your team’s long-term chances of success. Let’s look at a few examples of how contextual scouting could have helped some NBA teams avoid a few recent top five picks who didn’t work out for them. In the 2012 NBA draft the Sacramento Kings selected Thomas Robinson from the University of Kansas with the 5th pick. Robinson ticked off a lot of boxes. He had a productive and successful junior season. Robinson posted averages of 17.7 PPG and 11.9 RPG. He won the Big 12 Player of the Year award. People named him a 1st Team Consensus All-American, to the NCAA All-Tournament team and a Wooden Award Finalist. On top of all that, his team made it to the NCAA Championship game. At 6’9” and 237 lbs and in terrific shape, he looked like an NBA player. Everyone loves him as a human being. People frequently refer to him as a great guy. The potential flags only really showed up when trying to contextualize his performance — the first step of contextual scouting. Then it becomes apparent that Thomas Robinson struggled mightily in the few games he played against NBA-esque defenders. He didn’t have a consistent post move and consistent counter in order to score on bigger and better post defenders. He lacked the jump shot and ball handling to beat better defenders in face up situations. His own coach wouldn’t put future NBA player and Kansas teammate Jeff Withey on Robinson in practice due to this reason. Robinson’s offensive production was defined by physical advantages over his competition. We can subsequently ask, “How much of this player’s strengths will translate on this level of competition with bigger, stronger, longer, faster, springier, more skilled and smarter defenders/offensive players?”. We can see how his physical advantages would bring diminished returns against NBA defenders. While Thomas Robinson’s rebounding translated to the NBA level, his offensive production suffered mightily in relation to his collegiate production. He currently plays for BC Khimki in Russia. With the pick prior to the Kings taking Robinson, the Cleveland Cavaliers selected Dion Waiters from Syracuse University with the 4th pick. First, we look on Waiters’s college career and ask, “Does this player complement and elevate the skills of our stars and our core or does this player’s strength overlap or compete with those of our starts and our core?”. Then we can see Waiters would not be a good fit with Kyrie Irving, the Cavaliers’ star point guard at the time. Dion Waiters’s output at Syracuse — the reason he might get minutes on the NBA level — was tied to his ability to break down the defense and get into the lane. Irving had the same strength on offense. On the other hand, Waiters struggled to contribute on offense when he didn’t have the basketball in his hands. It’s easy to see why. Waiters likely never played off-ball much in his entire basketball career up to that point. Then you can add in the already difficult adjustment from college to the NBA and the fact that there is only one ball to go around. Thus we could foresee that the Waiters and Kyrie combo would not bring optimal results. And indeed they didn’t. While people still inhabit Waiters Island, the Cavs traded him during his third season in the NBA. In the 2015 NBA draft, the Philadelphia 76ers selected Jahlil Okafor from Duke University with the third overall selection. Jahlil Okafor, as a college freshman, produced well enough to be named the ACC Player of the Year and a first team consensus All-American, He also finished as finalist for the USBWA Player of the Year/Naismith/Wooden Awards. Okafor showed an ability scoring from the post that would translate to the NBA and earn him minutes. Consider the proliferation of Thibodeau-style 2.9 half court defenses and small/skill ball lineups emphasizing spacing in the NBA. We should question just how valuable post scoring really is in the NBA right now. NBA teams mostly use the post-up as a facilitation point to create higher value spot up or cut opportunities. And when we consider the second question above, we can see that Okafor’s weaknesses hurt. He struggles to pass out of the post. Okafor doesn’t rebound particularly well. He defends poorly. These weaknesses make it difficult for him to get minutes consistently in the NBA. He did get solid minutes for a team that proudly tanked his first two seasons in Philly. But he only played 12.6 MPG across a total of 28 games in a 2017-18 season split between the Sixers and the Nets. As shown, contextual scouting expands upon general scouting. or alongside different types of teammates. Asking these questions prepares you to help a team solve the often multimillion dollar decisions on draft night. This guest post was written by Josh Url. Josh mentors and teaches people how to solve problems in basketball using tools like Synergy Sports Technology. 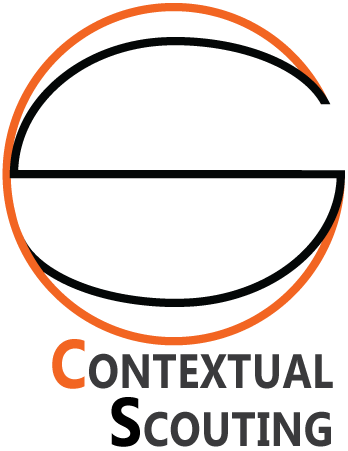 You can learn more about Josh and find out how to work with him at his website, appropriately titled Contextual Scouting.